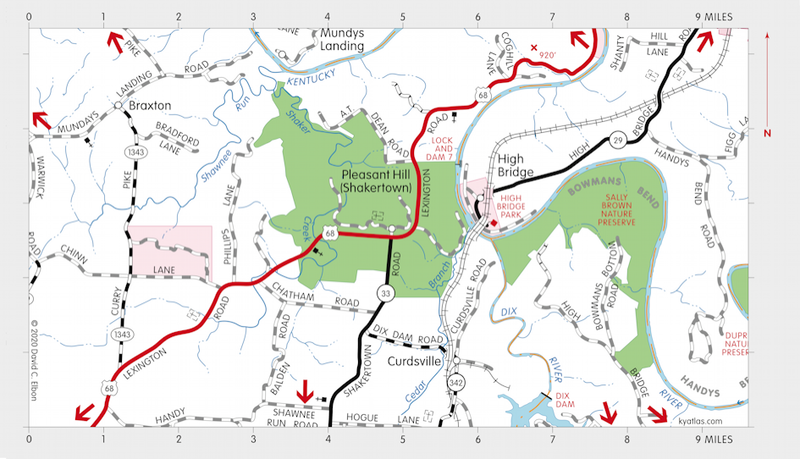 High Bridge is a Jessamine county community on the Kentucky River at the end of KY 29 about four miles southwest of Wilmore. It is just below the confluence of the Kentucky and Dix Rivers across from Shaker Landing. The train station that operated at the site from 1877 until sometime in the early twentieth century was known as The Towers. A North Tower post office opened in 1877 and was renamed High Bridge around 1887. It closed in 1976. 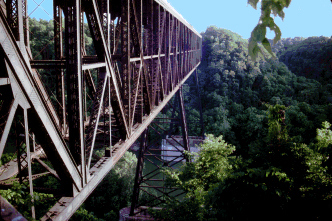 High Bridge carries the railroad over the Kentucky River. A bridge was begun in the 1850s for the Lexington and Danville Railroad. It was to be a suspension bridge, designed by John A. Roebling, but was never completed. (The stone towers for the suspension cables were built and remained until 1929.) A bridge of cantilever design was finally opened in 1877 on the Cincinnati Southern Railway, 275 feet tall and 1,125 feet long, and dedicated by president Rutherford B. Hayes in 1879. A new bridge was built around the existing structure in 1911 and expanded to two tracks in 1929. It was once the highest bridge in North America and the highest railroad bridge in the world.